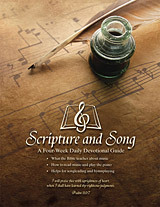 Personal or Family devotions, even for "non-musicians"
It’s not only for musicians, and it’s not just about music. The contents of this book can help you spiritually. Glorifying God in all areas of life, Spirit-filled living, and memorizing Scripture are taught and emphasized. 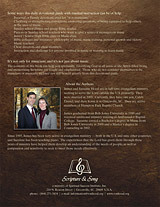 Those who do not consider themselves to be musicians or musically inclined can still benefit greatly from this devotional guide. James and Suzanne Hood are in full-time evangelism ministry, seeking to serve the Lord outside the U.S. primarily. They were married in 2003. Currently, they have one son, Caleb Daniel, and their home is in Greenville, SC. They are active members of Hampton Park Baptist Church. James graduated from Bob Jones University in 1999 and received additional ministry training at Ambassador Baptist College. Suzanne earned a Bachelor's degree in Music from Bob Jones University in 2000 and a Master's degree in Counseling in 2002. Since 1995, James has been very active in evangelism ministry — both in the U.S. and nine other countries; and Suzanne has been teaching piano. The experiences that the Lord has given them through these years of ministry have helped them develop an understanding of the needs of people, as well as compassion and sensitivity to seek to meet those needs effectively.